Town Hall is a restaurant in San Francisco and they make a great pepper jam that they serve with buttermilk biscuits. One day, when contemplating what to do with all the peppers I grew, I checked to see I could find the recipe. It turns out there’s a cookbook by the Town Hall chef and the pepper jam recipe is online. Clean and sterilize 2-3 jars and lids. Halve the peppers lengthwise and remove stems, seeds, and membranes. Chop into 1-inch pieces. Pulse the peppers in a food processor until finely chopped. Put the peppers to a heavy-bottomed pot and add the sugar, vinegar, and chile flakes. Place the pot over high heat and bring to a boil to dissolve the sugar. Lower the heat to medium-high, add the pectin, and cook, stirring until the jam registers 220°F on a candy thermometer. 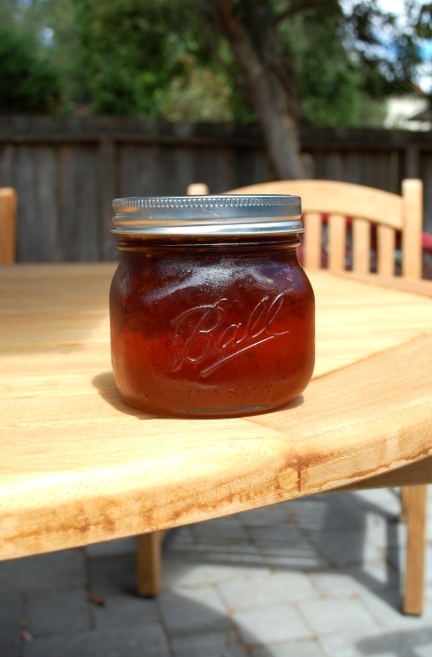 Remove the jam from the heat and let cool to room temperature. Transfer to the jars. You can seal them using this method or store in the refrigerator for up to a month. Enjoy! When you talk about gardening, it would be nice where you live. I live in the California Santa Clara valley. When I have concerns about fruit trees I talk to my friends in the local chapter of the California Rare Fruit Growers (crfg.org). Many of them are master gardeners and are an invaluable source of information. Ralph Lowd, thanks for the comment. I live in the San Francisco bay area. I agree, Master Gardeners are a great help.